networking for the shy girl. At one point in time, the word networking could easily make my stomach drop. I’m a self proclaimed, extroverted introvert. I love being social and surrounded by people, but as a shy girl, any type of unnatural or forced interaction would initially have me feeling totally uncomfortable. No one wants to ever approach someone and feel rejected! In college, it always felt so much easier to meet new people and collaborate. It was much more of an informal environment and you could easily find someone with like interests through a class or even through a mutual friend. However after graduating college, I soon realized that real networking was something that I just couldn’t avoid for long. No longer on a college campus, I now know that the only way I will be able to successfully meet people and build new relationships, friendly or professionally, is if I attempt to let guard down a bit. I must say that I've come a longgggg way in the last 6 months. Even just a few months ago, I would have never gone to an event alone. I now step out confidently, even approaching people first every now and then! Want to know how I did it? 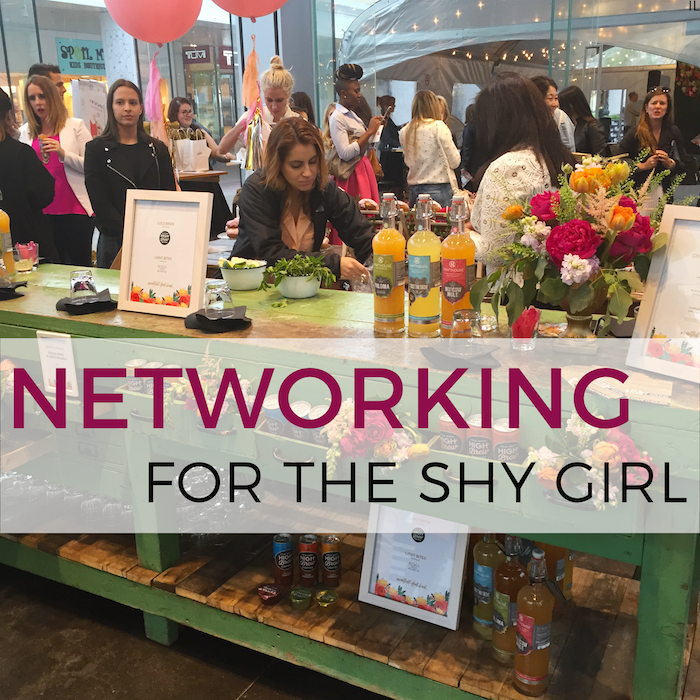 Check out my top 4 networking tips for my fellow shy girls out there! Leave Your Comfort Zone At Home: When heading out to an event, forget all of those preconceived notions that would normally hold you back from being completely open! Keep in mind that most people (especially at networking events) are also there hoping to connect with new people just like you! Be attentive and approachable. Standing in a corner looking down at your phone or with your arms folded…doesn’t really scream “come over & start up a conversation with me!" Attend Events That Make Sense For You: This has probably been the most helpful in my networking experience. I joined the Windy City Bloggers Collective in February and have had the opportunity to attend so many blogger and fashion events through my involvement with this group. Knowing that you’ll be attending an event where everyone shares a similar interest can be quite comforting and reassuring. If you’re a journalist attending an event with other journalists, it shouldn’t be that hard to join in on conversation since you’ll already have a list of talking points to pull from your own experiences. Bring A Buddy: When you're just beginning to attend events in hopes of networking, I definitely encourage you to bring a buddy. However, my original mistake with this approach was bringing too many buddies. Heading to an event with 4 of your closest friends might make you feel more comfortable but it’s actually a hindering crutch. Standing in a circle with a large group of people that you already know not only distracts you from meeting new people but it can make you all seem a lot less inviting. After attending a few events with just one friend of mine and noticing how easy it could be to network…I eventually was able to branch out on my own! Approach People Who Also Came Alone: For those events that you decide to attend alone, have no fear…there’s usually someone else coming who had the exact same idea. I’ve met and actually become friends with a few people that I approached or was approached by at events, simply because we both appeared to be solo. I attended the Create & Cultivate conference by myself last month and ended up meeting a girl that had a lot of similar interests as me! We ended up sticking together the entire conference and have plans to do lunch very soon. Going from shy to super confident while networking won’t happen over night. However, with a little practice, it will soon become natural to you. You never know who you just might meet that will bring a light to your life, as a business contact or even as a new friend! I loved this post! I'm a self-proclaimed "extroverted introvert" too, so I could def relate to everything you were saying! Especially being a recent grad, we really have to go the extra mile to meet new people now that we aren't in a concentrated environment anymore. Great tips! I am not a shy girl but thanks for the extra tips. Every little bit counts. Good luck with all your endeavorers.